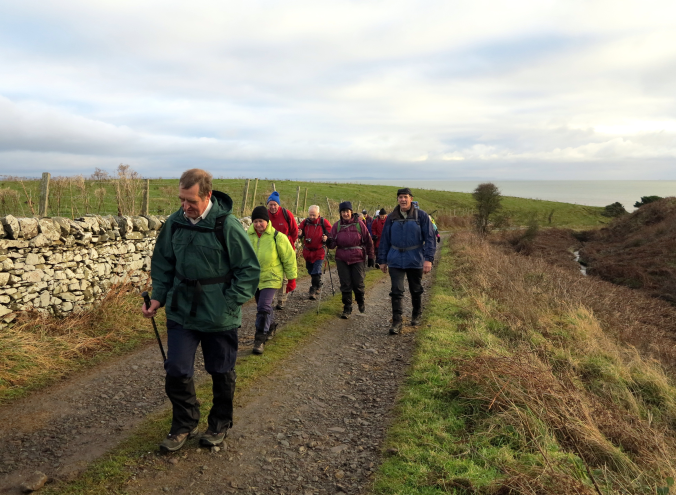 Ramblers’ report Saturday 15th December. A mild but overcast day encouraged twenty two ramblers to turn out for a 10mile walk along the coast path on Saturday. 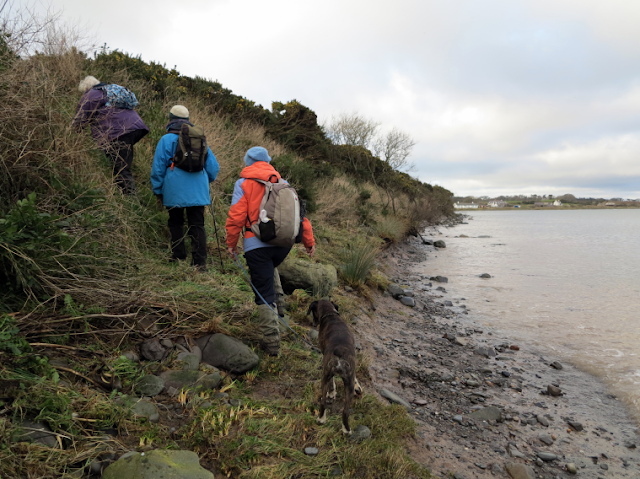 The route was to lead northwards from Drummore to Sandhead. I led the walk and Cath was back up. 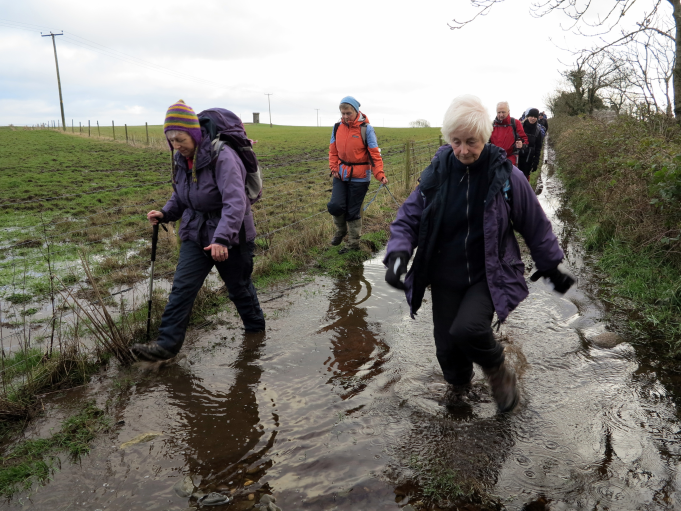 There were 22 of us in all, the others being Andrea, Richard, Mary, Jim, Audrey, Susan, Margaret, Jacqui with Tillie, Florence, Leslie, Duncan, Irene, John with two walking poles, Carl, Catherine, Allan, Heather, Peter and John. 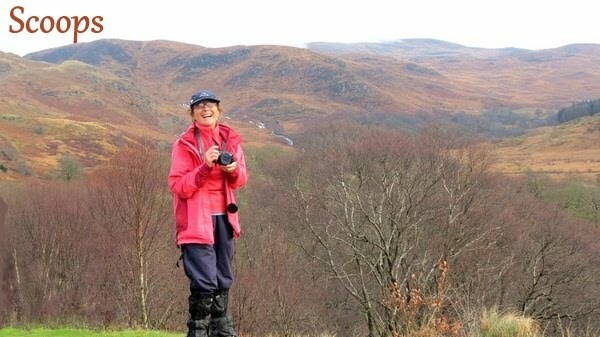 After explaining about Elaine’s inability to be there and giving a short explanation about the walk we set off out of Drummore. 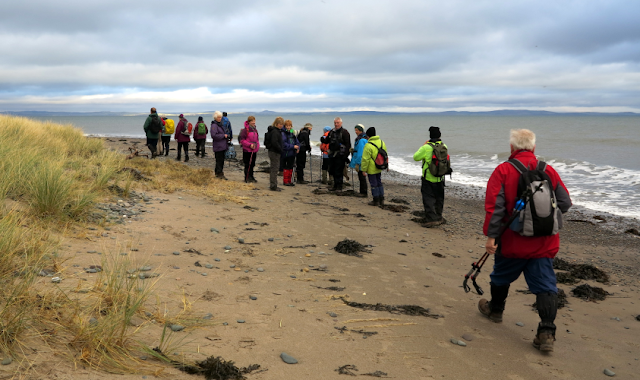 Cars were left at Sandhead and a bus journey taking in the delights of the Southern Rhins eventually dropped the company off in Drummore, to start the walk from the old mill by the harbour. 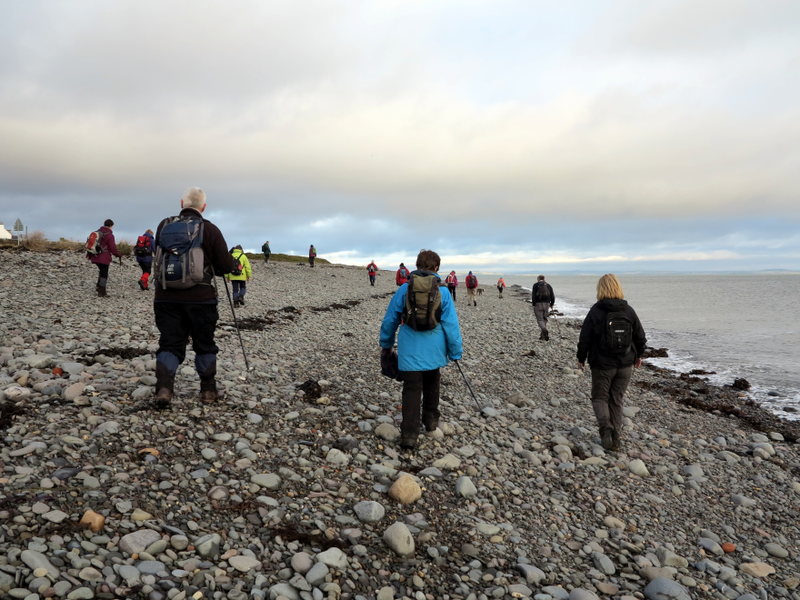 The tide was coming in, but there was no wind, so the problems were not expected, which had plagued the previous day’s high water, where debris consisting of mounds of seaweed and quite large stones were thrown up onto the path. The shore on the west side of Luce Bay is being washed away by the rough sea and the walk showed just how vulnerable the land is along here. The old road out of Drummore is no longer accessible by motors because of erosion, but provided a quiet introduction to a length of road walking where some walkers took to the wide sea wall with a good view of the water below. 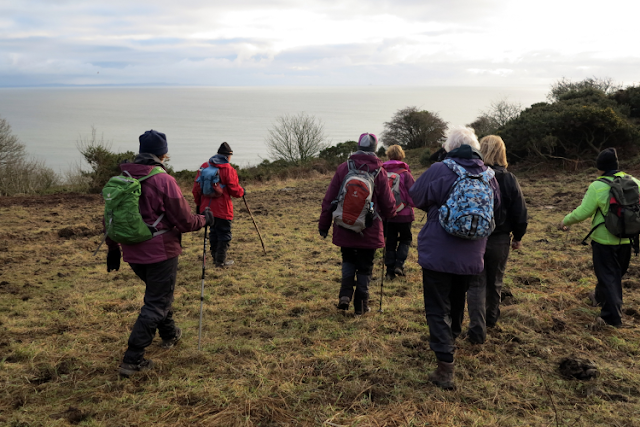 A section away from the sea, following the track up to Grennan farm brought a panoramic sight of Luce Bay, before descending once again to the road along by hidden quarries and brushy undergrowth. 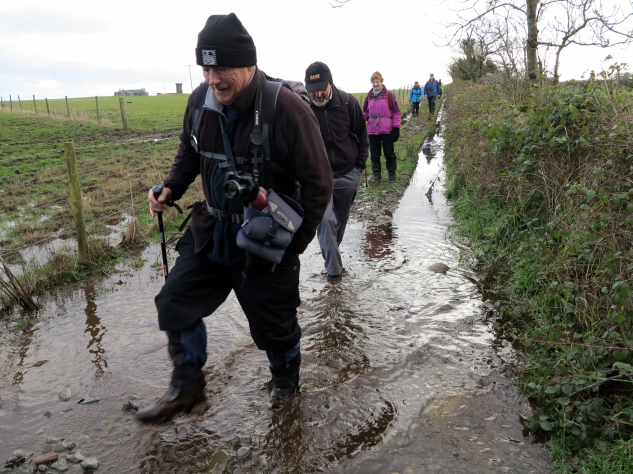 The weather was fine, not frosty and clear as it had been on Tuesday when we did the recce but certainly warmer. 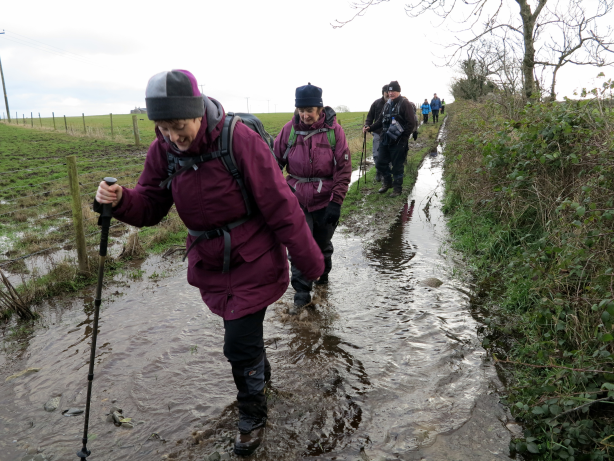 The downhill section from Grennan Cottage was probably a bit wetter than it had been and we slipped and slithered down it to the gateway next to the road. After following the track for a short while I led half of the group across the road, totally missing the extension of the track beside it. Cath found it, of course, and they joined us when they went through the kissing gate beside the entrance to the riding stables. Tarmac was avoided by walking a path alongside the road, through the edge of Grennan wood, sometimes muddy after the recent rain, to Terally road end. Across the road the foreshore, with the sea approaching rapidly was now enjoyed, until the roofless Terally coal store was reached. Old pictures show horses and carts queuing here to be loaded from beached shipping, a reminder of how this inaccessible corner relied on sea transport for such a long time. The sandy beach at New England Bay was nowhere to be seen as the tide rose and when Balgowan Point was rounded the shore had to be abandoned for the path cleared above the tideline. Well, there was a little sand here at Balgowan Point. Logan Mill is now just a tower lacking its sails, a corn mill dating from the seventeenth century. It was a perfect stop for lunch, where a late arrival put the numbers up to twenty three. The waves crashing onto the shore provided a pleasing accompaniment to the sociable picnic. Isobel joined us here for lunch. 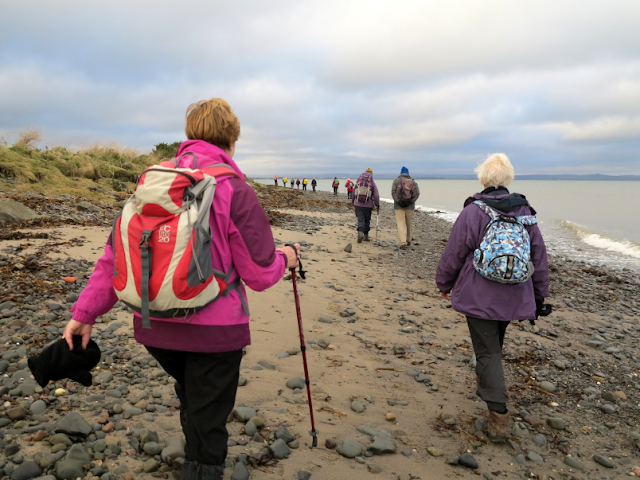 With time at a premium because of the short daylight hours, the walkers were soon pressing onwards, forsaking the coast path for a while to turn inland and pass by the nineteenth century Saint Agnes’ chapel. This was built by James McDouall, the Laird of Logan, and named after his wife, Agnes Buchan Hepburn, for the use of estate workers. 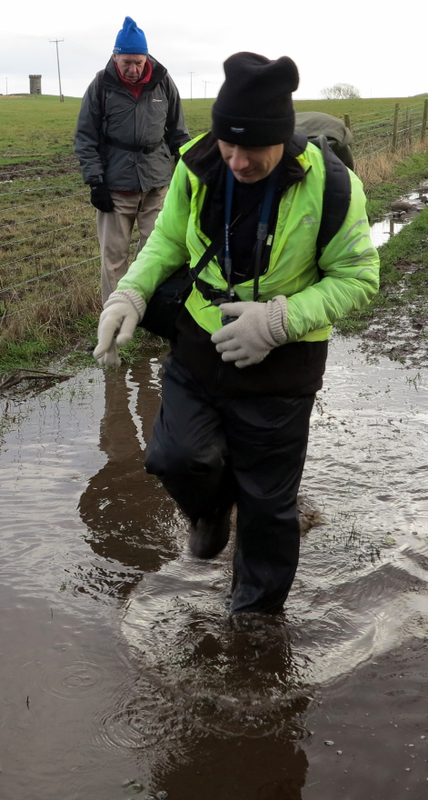 The track was flooded in parts but we negotiated the puddles easily enough, trying to avoid touching the electric fence beside it, which I was told was ‘live’. 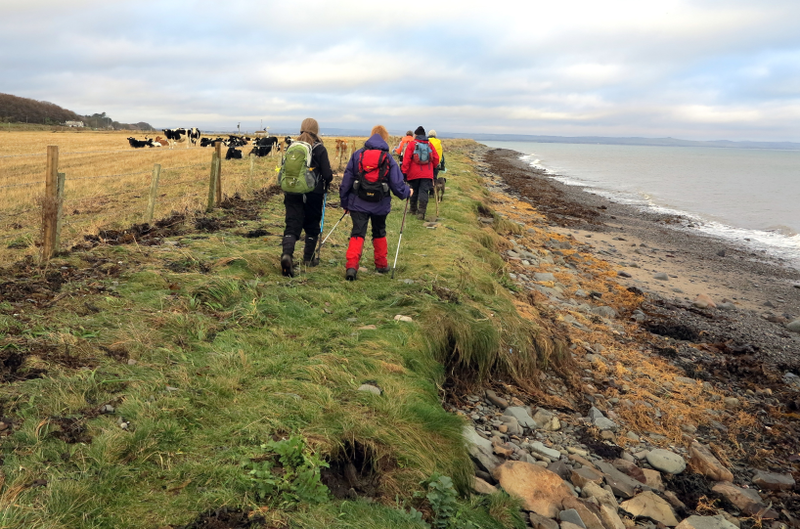 The coast path was picked up once more at Auchness where woods and fields alongside the road gave a safe path to Ardwell picnic site. Two delightful small bridges could be seen carrying the road over small burns, one with a beautifully built rounded arch. A ruined building and large gateposts were discovered along the old entry into the Logan estate. 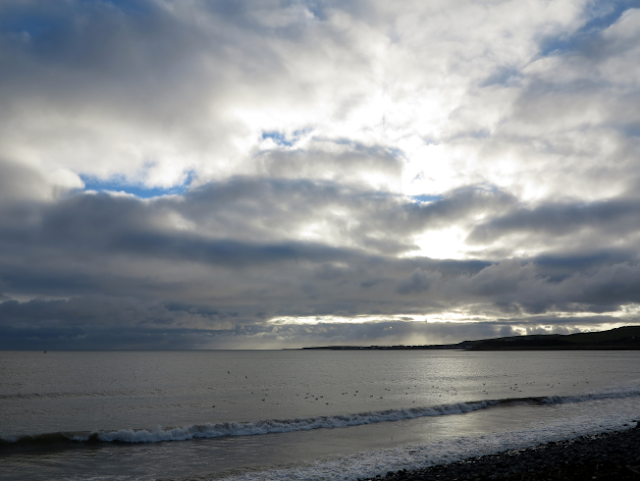 The shore was once more reached at Chapel Rossan house, where the old road used to take the seaward route, but was washed away long ago. The site is named for St. Drostran, an Irish monk. However, there is no sign of the old chapel to be seen today. Killaser burn is wide and deep and the road bridge crosses it, which meant that the pretty village of Ardwell, with a miniature town nestled between trees in one of the gardens, and a Norman motte above the old shop, was not missed. Again the ramblers progressed to the shore by Ardwell chalets and on to Ringvinachen point and the West Freugh outpost, used to monitor the range in the bay. Another rest was taken at Dyemill before skirting the house along the A716 and dropping to the beach once more by way of an old green road. The Dyemill is a reminder of the old textile manufactory of the area when it was renowned for its flax production. The high tide kept the walkers to the wooded path and the rather overgrown trail for the next section, passing Ardwell mill and a small cairn raised to commemorate someone’s beloved dog, Rebel. There was no sign today of the long legged, long beaked white bird, perhaps a great white heron, which had been seen feeding by an outfall pipe on Tuesday’s recce. As Sandhead came into view, a landslide which had fallen earlier in the week from the road south out of Sandhead, had been surprisingly washed away, with very little sign left of it on the beach, but leaving a great scar on the hillside, another sign of the encroaching sea on this coast. 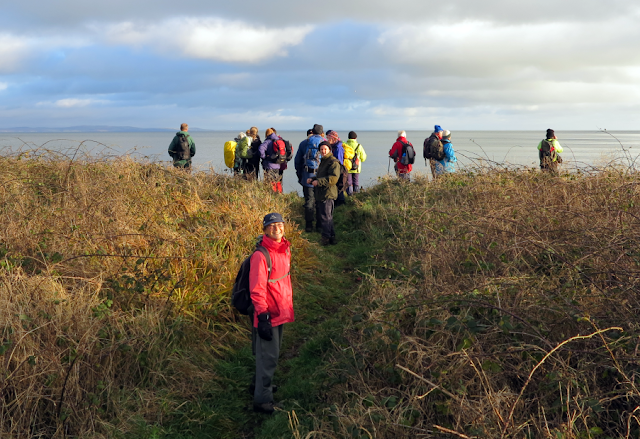 As the sky darkened and dusk began to fall, Tigh na Mara in Sandhead, welcomed the weary ramblers with tea and mince pies, a fitting end to this December walk. Having no footwear to change into, Cath and I were amongst the first to go into the Tigh-na-Mara where we helped to distribute tea and coffee with mince pies to the walkers. When we got there we found Isobel’s daughter, Joanne, and her partner, waiting for us. There were also quite a few other people there who wisely or very kindly made a move to allow us to take over their seats. Allan was the only one who did not join us. We were really warm in there, the fire burning well! There were more mince pies than walkers and some of us got a second one – I am not really a gannet, I think, but I had two! !